The last month has been tough for shareholders in the major Australian financial services companies, who have seen their share prices drift lower throughout March and April. Evidence of misconduct presented at the Royal Commission on Financial Services has fed market fears that bank profitability will be diminished in the future. However, Tuesday marked the start of reporting season for the major banks, which will allow these businesses to both demonstrate how their underlying businesses are performing, and show shareholders how they plan to address the issues raised at the Royal Commission. ANZ is first out of the gate, in what will be an interesting seven days for the management teams of the five major Australian banks. Overall, it was a pretty good result from ANZ that reported cash profits for the half of $3,493 million, or around 2% above expectations. The two drivers of this result were lower bad debt charges combined with falling costs, mainly due to a 4% reduction in employees over the last six months. Another metric that stood out at the result was ANZ’s strong capital position with a Common Tier 1 ratio of 11% (the strongest of the major banks), despite the bank buying back $1.1 billion of their own shares over the half. This capital ratio will increase when accounting for the proceeds of the sale of the Wealth Australia division. In an environment of low credit growth, this indicates that further buy-backs are to be expected. However, given ANZ’s limited excess franking credits these are likely to be conducted on-market. Last May the Federal Government announced the major bank levy to prop up the budget. This sent bank shares tumbling and resulted in much hand-wringing about how this “unfair tax” would damage bank profitability. Today’s result from ANZ (as was apparent in CBA’s result in February) shows that the bank levy has had minimal impact on bank profits, with repricing of the loan book offsetting its impact. Declining bad debts were a feature of this result for ANZ, with a charge of $408 million, a significant decrease from the $720 million charge in the 1st half 2017. Here ANZ is benefiting from a benign credit environment, and in particular, no significant bad debts in their institutional business. As with the last four halves, ANZ has benefited from the recovery of provisions taken against previous bad debts. In comparison to the other major financial institutions, ANZ has faced far fewer issues at the Royal Commission than their peers, though this reflects both ANZ’s smaller mortgage book and exposure to wealth management. ANZ’s CEO was asked this morning about implications that the Royal Commission will have for the Australian banks. He responded that the Royal Commission is unlikely to change the actual demand for mortgages, but what it is likely to do is to change the processes around getting a loan and make applications harder. These additional processes are likely to slow down credit growth in the near future and increase the costs of originating a loan. 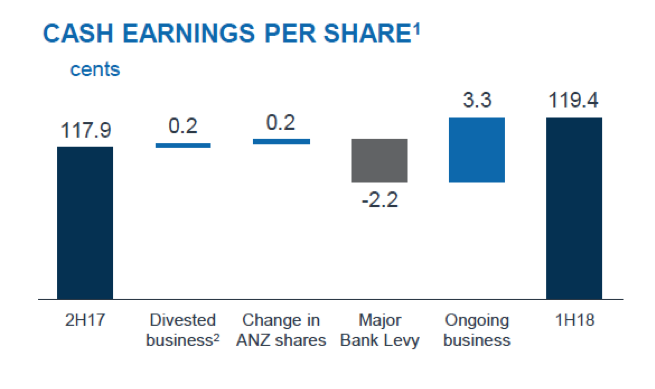 This was a good result from ANZ, showing the rebalance of the bank towards a simpler more focused entity, as the bank divests non-core businesses or segments that cause conflicts of interest such as wealth management. We own the bank in the Core Equity Portfolio and see that it trades on an undemanding PE of 11.5x with a fully franked yield of 6.1%. We expect that further capital management to be announced in 2018, which will support ANZ’s share price.